George Pajon Jr., writer and guitarist for The Black Eyed Peas and Fergie is a big fan of BBE stomp boxes and processors. Whether in the studio or on tour, BBE helps Pajon deliver the distinct fidelity and strength that personifies the 'Peas signature sound. 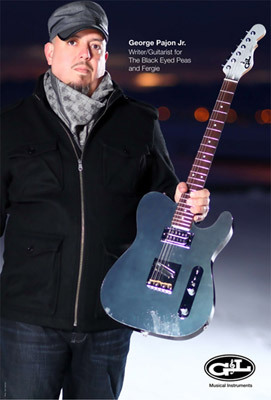 Pajon is shown holding his custom-made G&L ASAT Bluesboy built specifically for the Black Eyed Peas' "The E-N-D" World Tour 2010.